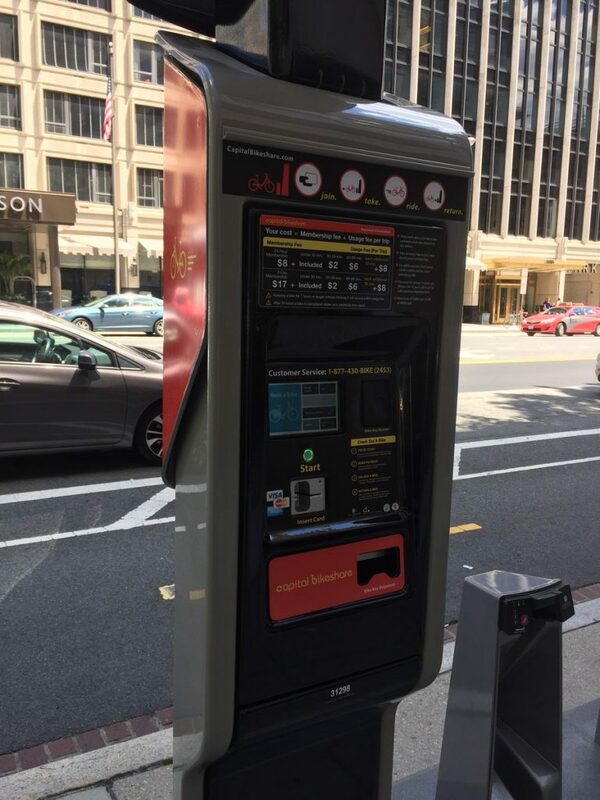 “The District Department of Transportation (DDOT) unveiled the first key fob dispensing Capital Bikeshare station in the District of Columbia. The new technology allows Bikeshare members to pick up a fob at the station, instead of waiting for new or replacement fobs to arrive via mail. The new station is located at 15th Street NW and M Street NW, an intersection with two protected bike lanes. With this station, DC joins Arlington and Montgomery County who have already launched key fob dispensing at select stations. To find other key fob dispensing stations, visit the Capital Bikeshare system map. The black fob decal indicates key fob dispensing stations. A radial key that provides ride time estimates. The maps are prototypes. They will continue to be reviewed and updated to ensure they provide the most-needed information to the best scale and format possible. Feedback is welcome and can be submitted to [email protected] (Header ‘Map Panel Feedback’). Along with new stations, Capital Bikeshare is now offering riders ‘day key’ short-term memberships. Visit capitalbikeshare.com/pricing/day-passes for more information.